Chakyar Koothu is a traditional dance form of Kerala that is performed in the temples. Chakyar Koothu was originally performed only in Koothambalams of Hindu temples. It is a highly refined monologue where the performer narrates episodes from Hindu epics like Ramayana and Mahabharata. Sometime it is done as stand-up comedy act, incorporating commentary on current sociopolitical events. Padma Shri Māni Mādhava Chākyār, a virtuoso of this art, who took Koothu and Kudiyattam outside the temples to the common people. He was the first to perform Chakyar Koothu for All India Radio and Dordarshan. It is a solo performance, by a narrator in a distinctive headgear and black mustache with his trousseau smeared with sandalwood paste and red dots all over the body. The headgear resembles snake’s hood, to symbolize the narration by Anantha, the thousand headed serpent.Ideally, the performance takes place in conjunction with festivals, presented by members of the Chakyar community along with the Ambalavasi Nambiars.The Chakyar narrates the story based on the Sanskrit style of “Champu Prabandha” – a mixture of prose (gadya) and poetry (shloka). He begins with a prayer to the deity of the temple. He then goes on to narrate a verse in Sanskrit before explaining it in Malayalam. The narration uses wit and humor to draw parallels with current events and local situations. 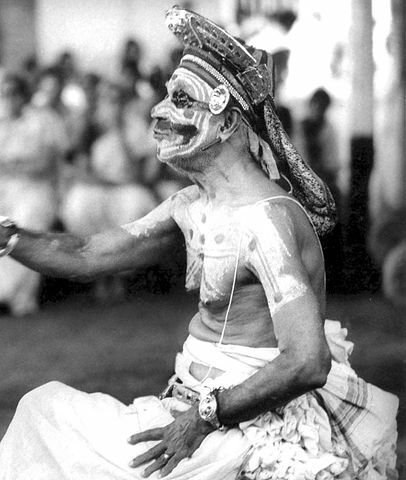 Koothu has traditionally been performed only by the Chakyar community. Two instruments accompany the performance – a mizhavu and a pair of ilathalam. This is different from the Nangiar Koothu, which is performed by women called Nangyarammas who belong to the Nambiar caste, and is a more highly refined theater art.